It is a good light hearted film and John Candy who was passionate about his Irish roots (good enough for me) to even have his burial have conditions. He was a funny man and died too young as his gentle but funny comedy films along with the likes of Dan Ackroyd were a bit of a golden era and there has not been many decent ones since his death in my opinion. Only The Lonely Film Review: I'm Glad That They Have Finally Put This Movie On DVD! 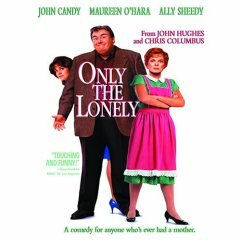 Comment: Only The Lonely is a good romantic comedy type movie that has a great cast that includes, John Candy, Ally Sheedy, Maureen O'Hara, Anthony Quinn and Milo O'Shea. The movie is about a Irish American cop who lives in Boston with his over bearing overly opinionated mother and he falls in love with a woman who is mother doesn't like. This is a cute movie and I'm glad that they finally have put it on DVD. Only The Lonely Film Review: I'm Glad They Have Finally Put This Movie On DVD! Comment: Only The Lonely is a good romantic comedy type movie that has a great cast that includes, John Candy, Ally Sheedy, Maureen O'Hara, Anthony Quinn and Milo O'Shea. The movie is about a Irish American cop who lives in Boston with his over bearing overly opinionated mother and he falls in love with a woman who is mother doesn't like. This is a cute movie and I'm glad thaht they finally have put it on DVD. Comment: With so many romance movies coming out, most of them based on a false love (money and/or lust)...it's refreshing to see a movie where the only thing the two characters love is each other. Neither character has much to offer...other than themselves...and that turns out to be enough. Throw in an intrusive mother for a little humor, and this movie has it all. Highly recommended. If you like this movie, you will probably also like "The Mirror Has Two Faces"
Comment: In John Candy's short but prolific film career he made few films that were up to his prodigious talents. This is the best of the bunch. There is no debating that Candy was up to the light-hearted comedy demanded of him in his role as affable Chicago cop Danny Muldoon. Candy was also more than capable of delivering on the dramatic elements in this story of a 38 year-old man finding love for the first time. Credit that to that to the capable direction of Chris Columbus and his knowing script. Candy also gets to play with some first class pros and I think that upped his game. Maureen O'Hara was lost none of her star appeal in her golden years as Danny's demanding mother. This role could have been played as a stereotype but O'Hara injects complexity and, yes, sympathy for her character. Ally Sheedy may also have had the best role of her career as Theresa, the introverted funeral home cosmetologist who is the object of Danny's affection. Anthony Quinn also delivers an amusing turn as Danny's neighbor who burns the torch for his mother. This film is an unqualified heartwarming success. Comment: It's great that "Only The Lonely" is being re-released. For a while it had been OOP. This is one of John Candy's best roles. I recommend getting it as soon as it's available. I know I will...I'm just telling it like it is! Danny, a cop, meets and falls in love with Theresa. They get engaged, despite sneaking around behind his mother's back, but when push comes to shove, he can't quite quit worrying about his mother long enough to be any kind of lover to Theresa.